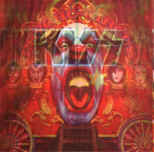 Track 01 : "In Your Face" was written by Gene Simmons for Ace Frehley to sing. Released as a bonus track on Japanese KISS "Psycho Circus" album, and as "Non-album Bonus Track" on various versions of the KISS "We Are One" CD-single. Track 02 : "Shakin' Sharp Shooter", written by Ace Frehley and Karl Cochran this song would become "Into The Void", with a little bit of suggestion From Gene Simmons. Track 03 : "Life and Liberty", an Ace Frehley and Anton Fig collaboration, written around the time of the "Psycho Circus" sessions. "You Make It Hard For Me" has long been known as a title of a song that Ace Frehley wrote with Sebastian Bach prior to the start of the KISS "Psycho Circus" sessions. The song was demoed by Ace Frehley, Sebastian Bach, Richie Scarlett, and Anton Fig. At the time it was easy to accept Sebastian's comment blaming Gene for the lack of the song's inclusion on the album. It was known that a lot of music had been written and had not made the album, not just Ace's material. From the Frehley/Kupersmith copyright it was noted that the song was written in 1985. Marty had copy-written the song (PAu-1-829-029) in early 1994 - correctly noting Ace's co-writing contribution. So, it would seem that the 1998 song borrowed at least the title from the 1985 composition. Additionally, Marty had released his version of the song on his 1996 album, "It'll Come To You" This release of the song could go some way to explaining the song's absence from "Psycho Circus" and further Ace Frehley interest. The demo recording of "You Make It Hard For Me" with Ace Frehley, Sebastian Bach, Richie Scarlett, and Anton Fig, is described in Sebastian Bach's book "18 And Life On Skid Row" (Chapter's 12 and 15). In 2009 the song ended up on Ace Frehley's "Anomaly" album with new lyrics entitled "Foxy & Free". According to Sebastian Bach, the 2009 version of the song is the same as the way they recorded it halfway the 90's ..., but without the co-writing credits for Bach. Finally, the original demo of "You Make It Hard For Me" is released in 2017, as one of the bonus tracks on the "Anomaly DeLuxe Edition". Track 06 - 08 : Ace Frehley related song titles mentioned in interviews during the "Psycho Circus" recording sessions. Copyright � 1997 - 2018 KISS-Related Recordings.